The key elements in the observance were remembering the national redemption of Israel in the Exodus from Egypt, linking that national redemption to Yeshua’s work of personal redemption (salvation), and looking forward to the restoration of both houses of Israel at the coming of Yeshua as Mashiach ben David (Messiah Son of David). That last element is perhaps the distinguishing feature of a Hebrew Roots or “Two House” seder as observed by we who identify as B’ney Yosef (Children of Joseph). A Christian Passover seder would be more instructional to show how Yeshua’s ministry and the Last Supper he celebrated with his disciples have their roots in the Exodus story. A Messianic Jewish seder would have that same emphasis, but would also include a personal identification of the Jewish participants with the people who came out of Egypt. This year that prayer for Elijah’s coming is what meant the most for me. The arrival of Mashiach ben David will solve so many unsolvable problems regarding the divisions among God’s people. The question of Messiah’s identity is what separates us of B’ney Yosef from our Jewish brethren, and the question of what Messiah has done and will do is what separates us from our Christian brethren. When he comes, those questions will be answered and the kingdom of David will be restored. Then we can get around to the serious business of carrying out our king’s work of redeeming and restoring the earth. That, I suppose, is what “next year in Jerusalem” means to me. It’s not merely that I want to live in the Land, but that I want to live there under the restored covenantal order of the King, the Son of David (haMelech ben David). Now let us see if I can answer question of why I do not consider myself a traditional Christian, yet I believe in Yeshua/Jesus. I grew up in a Southern Baptist church and was educated at a Presbyterian academy. That means my background is mainstream Evangelical Protestant Christianity. The scriptures I studied were the entire Old and New Testaments, with understandable emphasis on the New. What I learned about the Hebrew Bible (the Old Testament) was that it contained the foundations of our New Testament faith, and that Jesus Christ had completed the work promised by the Hebrew prophets to bring salvation and redemption to all of humanity. The Israel I learned about was entirely Jewish, meaning that none among my pastors and teachers made any distinction between the Jewish and non-Jewish parts of the nation. According to them, those tribes that followed Jeroboam into rebellion were just as much Jews as those who remained loyal to the House of David in the kingdom of Judah. Consequently, the understanding I had was that we Christians owed much to the Jewish people, if for no other reason than because their rebellion against God made it possible for all the rest of us to come into His kingdom. I had no need to learn anything about the “Jewish feasts” or any of those laws about the Levitical priesthood and the Temple service because Jesus had fulfilled all of it and instituted something new. 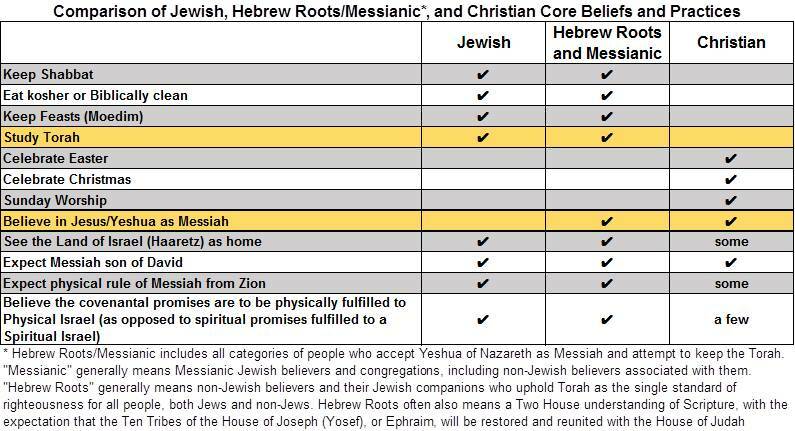 This chart, originally developed by Pete Rambo, illustrates the correlation of basic beliefs among Jewish, Hebrew Roots/Messianic, and Christian followers of the God of Abraham, Isaac, and Jacob. That understanding began to change around the year 1989, when my wife and I discovered the teaching of the late Zola Levitt. As a Messianic Jew with a gift for teaching, Zola built a ministry educating Christians about the Hebrew roots of their faith. Thanks to him I learned that the Passover, Jewish wedding customs, and many other elements of Jewish practice were reflected in the Gospels in the ministry of Jesus Christ. It was from Zola that I first learned the Messianic meanings of the various Passover traditions, seeing Yeshua’s work as Messiah as a consistent thread running throughout those traditions. This began the process of my questioning the things I had learned in my traditional Protestant upbringing. About ten years later, the pastor of the Presbyterian church where we were members preached an Easter sermon that explained how Jesus could not have been crucified on Good Friday. If he had died on a Friday, he could not have fulfilled the prophecy of being dead three days and nights before his resurrection on Sunday. This pastor walked us through the timeline of Passover, Unleavened Bread, and First Fruits, explaining the difference between the weekly Shabbat and the High Sabbaths of the Feast. His conclusion was that Jesus was executed and hastily buried on the Day of Preparation, which was a Wednesday, and that the following day (Thursday) was the High Sabbath of Unleavened Bread. The day after that (Friday) was a normal work day, so the women who wanted to properly prepare Jesus’ body for burial could buy the spices and other items they needed, then rest on the weekly Shabbat, and on the first day of the week (Sunday) go to the grave, which they found empty thanks to the resurrection. God instituted the Sabbath and the Feasts such as Passover and Tabernacles. Today we don’t celebrate those days, but we honor Sunday and Christmas and Easter, which do not appear in the Bible as days God has commanded to celebrate. Does this mean that the Christian church has sought to change times and laws? Is that is so, does that mean the Christian church is operating in the spirit of antichrist? All of this occurred within the space of a couple of hours on that November day in 2001. At the end of that time, I began to pray for the Lord to explain to me how “Grace” and “Law” work together. Clearly they were not contradictory as I had been taught, but compatible in some way. The answer He gave over the next few months is what started me and my family on the path back to Torah. We realized that the Christian Jesus we had known all our lives was not exactly the Jewish Yeshua of historical reality. We learned that Yeshua never intended for his followers to depart from Torah, but rather wanted to teach all of them – both Jews and non-Jews – to follow Torah more exactly as God had intended all along. Before many years had passed, my family had begun to observe Shabbat and celebrate the Feasts as well as we could, adjusted our eating habits to remove those things which the Lord had declared were not food, had ceased observing Christmas and Easter, and had moved out of the Sunday church to join with a Messianic Jewish synagogue. During that whole process, we remained decisively attached to Yeshua of Nazareth as our Messiah, knowing that if it were not for him we would have no connection at all to Israel and no reason to follow Torah. This is where we come to a further complication. What I have just explained is not exactly what our Messianic Jewish brethren believe. They see the world as divided into two categories: Jews and Gentiles. Israel consists entirely of Jews, whether Messianic or non-Messianic. Everyone else, even if they believe in Yeshua/Jesus, are still Gentiles and not exactly part of Israel. Thus the Torah is only for Jews, and the Noahide laws for are for everyone else. They believe the Ten Tribes of Yosef/Ephraim reintegrated into the Jewish nation in ancient days before the Babylonian Conquest, and that any teaching today which says the Ten Tribes are to return is either a heresy or a deception. Such an understanding is compatible with traditional Christian thought, which at best acknowledges that Jews have some role to play in God’s plan, but that unless they accept Jesus as Messiah they cannot be redeemed. At worst, Christian teaching says that the church has replaced the Jews and has become the new, spiritual Israel. If we carry this to the logical conclusion, it means that the true Israel is now Gentile. That does not leave much room for someone like me, who understands that the real division of the world is not between Jews and Gentiles, but between Hebrews/Israelites and Gentiles. I do believe that salvation and redemption (which may or may not be different things) is through Messiah Yeshua, but I am coming to understand that it is more important to believe the promises of God and do as He said rather than to comply with a simple formula of “praying to accept Jesus into your heart”. If Yeshua taught us to follow Torah and believe in God’s promises of resurrection and restoration, and I am now doing that as best I can, then I am actually doing the same as my observant Jewish counterpart who does not necessarily share my belief in the identity of Messiah. 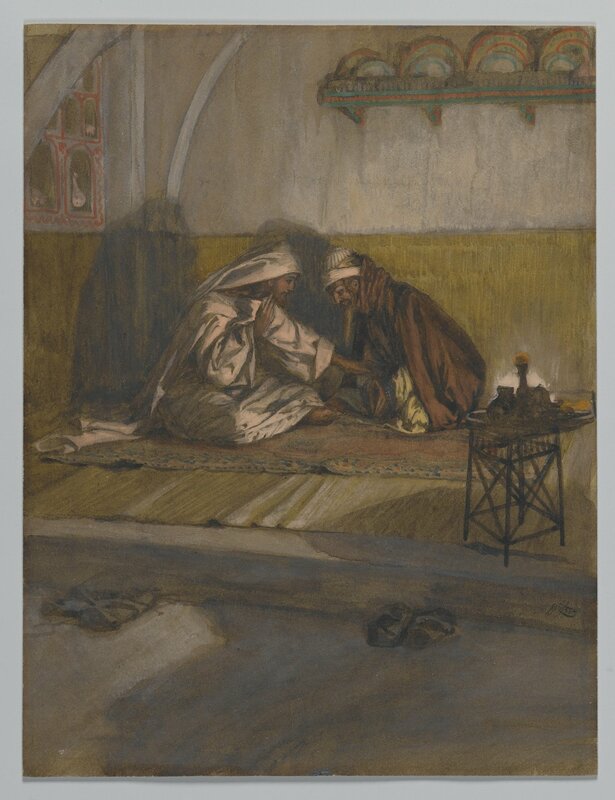 This is not a “gospel of works”, but rather one of faith: we both believe the Lord will redeem and restore His people Israel and work through them to redeem the nations and the earth, and it is on the basis of that faith that He imparts His righteousness to us just as He did to our father Abraham. Because of that, we desire to please Him and do as He has commanded in Torah. I am persuaded that upon the coming of Mashiach ben David, everyone will know that he is Yeshua of Nazareth who came once as Mashiach ben Yosef. However, I also know that the Mashiach who is to come will have a name no one knows yet (Revelation 19:11-12). That means we will all be surprised, and we will all need to humble ourselves and throw out our misunderstandings so the Lord can correct us. Do you see how this line of thinking is not exactly Christian and not exactly Jewish? It requires a much different understanding of “salvation” as something bigger than a simple formula of a sinner’s prayer, and it requires a much different understanding of Israel as something more than Jewish. As long as our Christian brethren worship a Jesus divorced from Torah and Israel, we have some profound differences which will interfere with our fellowship. As long as our Jewish brethren expect the Lost Tribes of Yosef/Ephraim to return as Jews, we have differences just as profound. I do not know if there is a human solution to this dilemma. All I can do is to rely on the Spirit of God to break down paradigms on both sides and open the way for true reconciliation among all His people. Great job putting that in easy to understand words Al! Change a few names and locations and is the story of me and my family! P.S. I love Pete’s chart! Glad this is a blessing. Pete’s chart is a huge help in understanding all this. And I’m sure we all have variations on this same story – which is why we need to share! yes, amn halleluYah! that’s the crunch point. I understand that prayer for each other, for our brother as for ourselves are most important for more deeper repentance and the urge that the father might open our all eyes and ears more as what already happened on the way to become One; that we act complete in what 1.Cor. 13 describes so wonderfully with the emphasis on the last 2 verses: 1Co 13:12 “For now we see in a mirror, dimly, but then face to face. Now I know in part, but then I shall know, as I also have been known. 1Co 13:13 And now belief, expectation, and love remain – these three. But the greatest of these is love.” As we are going towards the final goal of the Father to make us to One stick, we do what is in our understanding and our ability now as good as we can and what we can’t now, He will help to it in everything what needs to overcome the barriers. It is Yah’s Spirit bringing it all perfectly together in the end though we sometimes not even see how.. Continue staying focused on Him, The Ultimate Love as our example, our pattern is crucial. I also understand that so many of our messianic Jewish brethren have been taught by Christianity, where we have been coming out from mixed with what the rabbis teach. These doctrines which made us come out of her is contributing to this huge amount of barriers we now clash with again! My devise is always wait pray and see when I stuck in something. Al, thanks for cleaning that chart up.. Looks much better than the rudimentary sketch I made. Blessings, bro, and thanks for all you do. Great chart! I enjoyed the contrasts b/w Messianic’s and Hebrew Roots. I identify more with the Hebrew Roots, but most people have never heard that one, whereas Messianic rings a bell. Probably even more reason to say Hebrew Roots(or Ben Yosef) so it will stand out in the future. I think you guys are doing a wonderful job acknowledging commonalities, while also showing our uniqueness. What a great explanation! And sounds so much like our family’s background and journey. Great explanation and chart! This sounds so much like our family’s background and journey.